If you plan to wear a vintage inspired bridal gown on your wedding day, you may require slimming undergarments bridal lingerie to help you fit snugly into that hour-glass shaped wedding gown, fashioned after the mid-twentieth century fashion styles. Bridal slimming undergarments allows a bride achieve a perfect fit in a vintage gown that's been designed and made to look classic, appealing and chic. Today, with the heightened interest in vintage apparel, a bride-to-be now has the luxury of choice of lingerie, with many beautiful designs of bridal undergarments created both for inner and outer wear. These shaping undergarments sometimes come accessorised with details such as pretty beaded straps, rhinestones, delicate lace trims or embroidered embellishments that can be partially or totally exposed, showing as part of a bride's outerwear. 1. Wedding Corsets - A proper bridal corset is a slimming undergarment primarily designed to pull in the waist a few inches. Desired tautness will depend on how tight it's laced up. A wedding dress corset is like a bodice, worn to mould and shape the torso. Over 60 years ago, whalebone was used to shape and form a corset. Luckily today made to measure bridal corsets are produced with steel 'bones' which gives them a great hourglass shape. 2. Bridal Basques - Are tight fitting bodice or short 'coat'. It is also a stylish and slimming undergarment and outerwear that many refer to as a 'waspie'. A Basque does not necessarily pull in the waist, but it shapes the upper body. They, however, do have steel bones as well. 3. Bridal Waist Cincher - The waist cincher was very popular with the 80's bride, and women generally. It’s a type of wide lace belt, made with elasticized fabric and soft plastic stiffeners. 4. 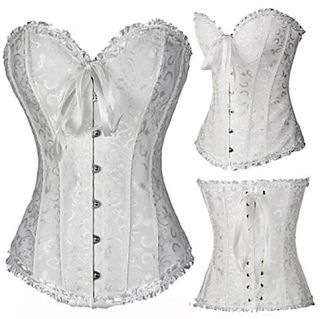 Bridal Bustier - A bustier with it's close-fitting, sleeveless, and usually strapless bodice, is worn by brides as a slimming undergarment or as an outer apparel. A bustier is similar to a basque but comes shorter. It reaches down only to the ribs or waist. Bustiers' shapes the waist in a more gentle way, pushing up the bust, tightening against the midriff, forcing them firmly up. The use of boning is quite common in bustiers, but they are often fabricated using mesh panels. A multi-purpose garment, it doubles as a push-up bra for inner wear and as a camisole for outer wear. 5. Vintage Inspired Bras - The design of the bridal gown usually determines the type of bra that must be worn. The bra must support and elevate the bosom in most vintage inspired wedding gowns. Depending on the bridal gown's bodice, the style of the skirt, the cut of its neckline and whether it is cut high or low at the back, the bra that is chosen must certainly conform with the style of the gown. Popular among the 'vintage brides' is the long line strapless bra which starts at the bust line, ending down at the waist. It has some boning and includes multiple hook and eyelets which both gives it extra firmness and added support, thus acting as an effective bridal slimming undergarment. So for the bride, mother of the groom and mother of the bride, getting into that beautiful dress on that great day demands a lovely silhouette. With vintage inspired wedding apparel, the outfits must not seem too tight, so if you have been trying unsuccessfully to lose weight or shed a few pounds, don’t worry too much about it. 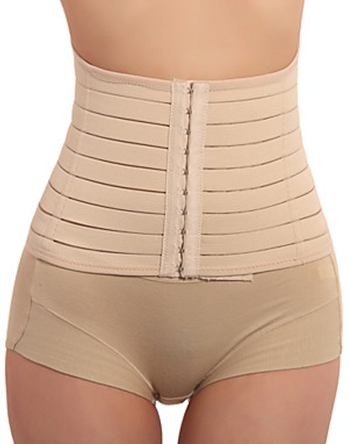 Bridal slimming undergarments will do a great job of holding in a few unsightly folds. Many regular type bridal lingerie looks very pretty, but they will neither slim down nor shape the body.Wearing bridal shapewear and slimming undergarments is the answer, asides dieting. Many of these bridal wear will slim and shape, helping one fit into a chic dress on the wedding day. Bridal lingerie is the first thing a blushing bride puts on for the big day and the last thing she removes for that special night. Intricate and delicate detail work makes bridal lingerie an item worthy of particular attention. So choosing just the right bridal slimming undergarments for the right wedding gown will help make it a wonderful day to remember. The wedding website photographs and videos will tell the story.